Widow's Jar Ministries, Inc. was founded by Sandy Van Vlymen and Shelia Puckett in 2004 and was incorporated and granted 501(c)3 tax exempt status in 2005. Desiring to help meet the personal and ministry needs of Gospel preaching missionaries on the field, and to minister to the needy, we are presently servicing missionaries, the needy and homeless throughout the world. It is only as a result of the generous donations of fellow Christians, who desire to assist in these needs and have chosen to do so through us, that we are able to assist. 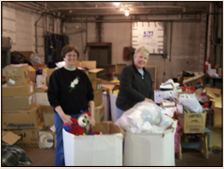 Sandy Van Vlymen and Shelia Puckett sorting donations in original warehouse. 1. We believe that the Bible is God's Word, fully inspired by Him and is our rule for faith and practice. 2. We believe in one God, revealed in 3 persons: God the Father, God the Son and God the Holy Spirit. 3. We believe in the virgin birth and absolute sinlessness of Jesus Christ. 4. We believe in the sacrificial death by the shedding of blood of Jesus Christ for the sins of mankind. 5. We believe in the literal, bodily, physical resurrection of Jesus Christ from the dead. 6. We believe that salvation is by God's grace through faith alone in Jesus Christ. 7. We believe in the literal, bodily, physical return (second coming) of Jesus Christ. 8. We believe in the reality of Heaven as the eternal home of the redeemed, and a literal Hell as the eternal torment of the unsaved. 9. We believe baptism is a picture of the death and resurrection of Jesus Christ for those who have received Christ as Saviour and not a prerequisite to salvation. 10. We believe salvation is eternal and can never be lost.